A few months ago, I had found out that a pal I had met through Black Milk Clothing had launched Gypsy Rose Cosmetics, a natural cosmetics line with some of her best friends. All three ladies also happened to be former LUSH employees, so obviously my ears perked up. 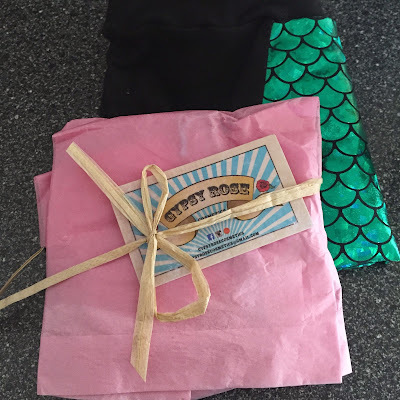 Gypsy Rose Cosmetics procured the cutest care package with an assortment from their brand spanking new product line + being a former LUSH employee myself, to say I'm picky about the products I use on my body is an understatement. 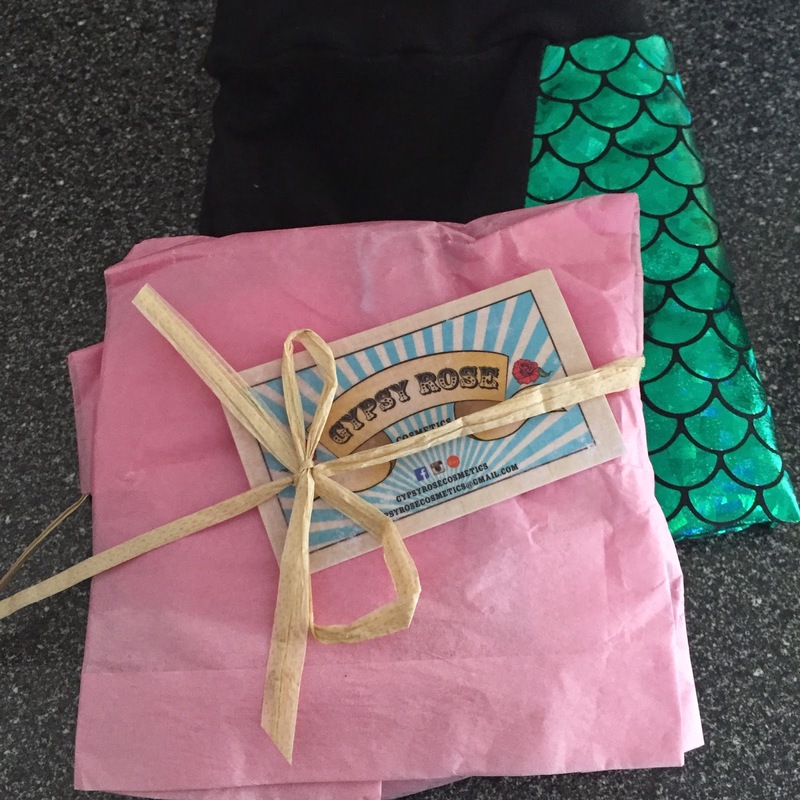 Gypsy Rose Cosmetics passes the test, so scroll down to see what goodies the gals sent me + to snag a coupon code for 15% off your order. 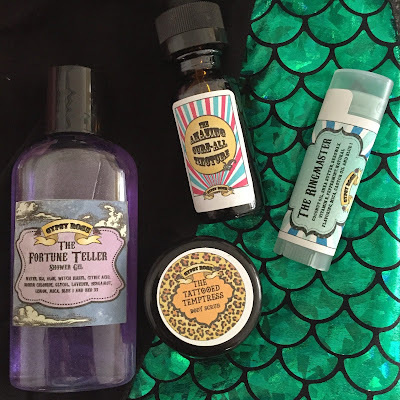 I opened up my parcel to find a nice assortment of products - The Fortune Teller shower gel, The Tattooed Temptress body wash, The Ringmaster Lip Balm, The Amazing Cure-All Tincture + a pair of their Mermaid High Waisted Knickers. The Fortune Teller is reminiscent of LUSH's sought-after Twilight shower gel. Lavender, bergamot + lemon are some of my favorites, super calming and mind-clearing. I prefer the consistency of GRC's shower gel over LUSH's formula + like how the shimmer powder is actually suspended in the gel, unlike Twilight, which sinks to the bottom of the bottle + refuses to surface. I love The Fortune Teller's scent, but wish it were a bit stronger. The Tattooed Temptress smells just like a chocolate orange. Upon opening the jar, I just kept sniffing it + sighing, hahaha. Its amazing! This sugar scrub is gentle + leaves you moisturized, plus the scent lingers for a bit, which I like. The Ringmaster is probably my favorite product, because I use it daily. It smells + tastes like Orbit Sweet Mint gum, but without that slightly creepy artificial aftertaste. The consistency is also amazing - its not waxy or sticky + moisturizes really well. The Amazing Cure-All Tincture is good for a plethora of uses, thanks to the essential oil blend. My favorite as of late? Using after I shave, mixed with equal parts water. Sounds weird, but its awesome. The High Waisted Knickers are cool, but I feel that since I'm so short, they come up too high on me. It might be that I'm just not used to the cut, but I can see myself wearing these as a bathing suit bottom, not underwear. I was telling a friend last night that if I'm daring enough, I may wear them to the Coney Island Mermaid Parade! Gypsy Rose Cosmetics offers all of their scents in multiple products. Each scent has its own shower gel, body scrub, soap + lip balm. I've been eyeing The Mermaid shower gel + The Bearded Lady, which is their new deodorant paste. If you use the code GYPSYGIRLS1, you'll save 15% on your order.